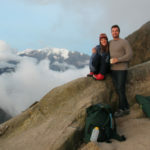 Dan and Kim began their romantic adventure in charming, colonial Quito. Then, they were off to the Bellavista Cloud Forest. 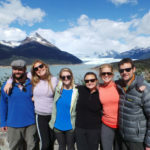 Here, they found an incredible variety of flora and fauna, and were on the lookout for over 170 bird species as they hiked to waterfalls and through the natural reserve. 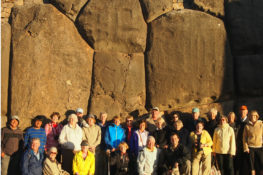 Their last stop was in the Galapagos Islands, where the couple explored the islands of Floreana, Isabela, and Santa Cruz on a land-based program. Their time in the archipelago was filled with activities, including snorkeling, hiking, kayaking, and more, as well as plenty of time to relax and enjoy the islands and its wildlife. Do you want to travel to Ecuador and the Galapagos? We’re regional experts here at Knowmad Adventures and pride ourselves in building custom trips that are a perfect fit for our travelers. If you’re interested in crafting an adventure combining several regions in Ecuador, but this particular itinerary doesn’t strike your fancy, don’t hesitate to reach out to our Trip Specialists at 612-394-2894 or travel@knowmadadventures.com to begin planning your trip today! You will fly from the USA to Quito arriving most likely in the evening. Upon your evening arrival to Quito you will be met at the airport and transferred to your stunning hotel in the heart of the old historic center of Quito. Today, you will be picked up at 8:30 a.m. Enjoy a half-day guided exploration of Quito as you walk down quaint cobblestone streets lined with brightly colored colonial houses and balconies dressed in flowers. Visit the Plaza de la Independencia and the impressive La Catedral de Quito, one of the oldest cathedrals in South America. Then see the Presidential Palace along with other historically and architecturally rich buildings lining and surrounding the square. Visit some of the most important churches built around the 16th and 17th centuries, including the monastery of San Francisco, which was started just five days after the founding of Quito in 1534. Then visit Panecillo hill for spectacular views of this incredible city. After lunch at a typical Ecuadorian restaurant, visit the fascinating Intiñan museum, dedicated to the promotion and study of the nations that inhabited the equatorial area. Return to your hotel for a relaxing and romantic evening. You will be picked up from your hotel in the morning. Leaving Quito, you will descend a scenic mountain road. Reaching the turn to Bellavista you climb to the top of the mountain for fabulous views, where Bellavista’s lodge is perched. Settle into your room and enjoy the flurry of the hummingbirds or take a hike into the forest on the varied trails. After lunch you can take a hike on your own into the forest, or go on one of the all-included guided hikes. Your guided hike will acquaint you with the exuberant vegetation of the cloud forest, its bird life and the fascinating adaptations to life in this special environment. Return to the lodge for a relaxing evening. Wake up to the sounds of nature or go for an early morning bird hike, followed by a delicious breakfast. Afterwards we recommend hiking to a waterfall hidden in the forest or walking the self- guided trails. After lunch, an afternoon hike deep into the valleys of the reserve is recommended. Enjoy a relaxing evening to spot night birds and other nocturnal wildlife. Wake up for another early morning bird hike, or simply relax at the lodge. 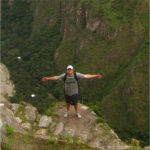 After breakfast take an additional hike or soak in the sights and hummingbirds from your lodge. Depart the lodge in the afternoon, arriving to your hotel, conveniently located near the airport, for a relaxing evening. Today you will be picked up at your hotel at 6:45 a.m. (please have your bags packed and be ready waiting in the lobby) and fly to the Galapagos Islands. Upon arrival in Baltra, you will first pass through an airport inspection point where your TCT (Transit Control Card) will be checked and stamped (please keep this carefully with your passport as you will need to show it again when you leave Galapagos). At the airport you will be met by your expert local guide who will give you useful background information before transferring to Santa Cruz, which involves public transport (no private vehicles permitted) overland to the Itabaca Channel and a short crossing on the public ferry. Now your journey really begins, with a visit to the impressive Los Gemelos craters and a look at the highland Galapagos tortoises. At midday enjoy a tasty box lunch en route to the town of Puerto Ayora where your private speedboat will be waiting to take you on a two-hour ride to the island of Floreana. This peaceful island is home to the Galapagos’ smallest population, only 150 people, and is also the least developed and most natural of the four inhabited islands. Once a pirates’ lair, Floreana was the first inhabited island in the Galapagos and descendants of the original population still live here together with the mysterious tales and legends that surround their ancestors. 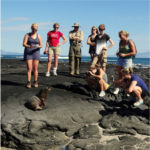 On Floreana you will be hiking, learning about the fascinating history of the local people, and seeing some of the Galapagos special wildlife (giant tortoises, frigate birds, Darwin’s finches, sea lions, and petrels). You will check in at your lodge overlooking the Galapagos’ most beautiful and secluded bay. After that you will take a short walk towards La Loberia (a sea lion breeding ground) and then for your first marine encounter, snorkeling and swimming in the warm bright water with sea turtles, sea lions, spectacular rays and lots of shimmering fishes. In the afternoon return to the lodge and have dinner in the village. After breakfast you will leave to explore the Floreana highlands on your open-air bus (chiva), an unbeatable, historic, and comfortable way to see the island. On the way your Naturalist Guide will point out the wildlife and give us an idea of the colorful history of some of Floreana’s first inhabitants, such as the Wittmers (whose descendents still live on the Island), the ‘Baroness’, and the pirates that once visited here. They will also tell you about the “Enigma of Floreana”, involving the mysterious deaths of several of the Island ́s inhabitants, a riddle that has never been solved. After driving into the highlands, you will reach Asilo de la Paz (Peace Haven) where your hike begins. You will walk up to this historic site, explore pirate caves, and visit the freshwater spring that provides water for the entire Island. Along the way, you can expect to see giant tortoises lumbering around in the vegetation or even on the trail. Then, you leave Asilo de Paz walking down through a rural area where the local people grow produce for their own consumption. Once back on the coast you will be able to watch the extraordinary behavior of the frigate birds who ‘dance’ as they wash their salty wings in the fresh water. With a little bit of luck, you may be able to see males puffing up the red pouches on their chests in an attempt to attract females. From La Primavera you continue by Chiva down towards Las Palmas, where the Island’s first permanent inhabitant, the eccentric Dr. Ritter, lived and is buried. Arriving in 1926, this German physician believed that with a combination of exercise and the right vegetarian diet he would live to be 150 years old. He didn ́t, but his story is one of the many strange episodes that still abound on the island. On the way you will see spectacular views of the Floreana shoreline, and on arrival sit down to a special BBQ. In the afternoon, back at the lodge, you can do more marine exploration, snorkeling, kayaking and stand up paddling, SUP, the newest water activity. Today you will be met at 8 a.m. and take a morning speedboat and transfer to Isabela Island where you will check into your hotel. Your Isabela adventure begins with a tour of the Tintoreras, a group of small islands near the village of Puerto Villamil, that are named after the white tipped ‘Tintoreras’ reef sharks that swim in these calm waters. A Galapagos in miniature on the Tintoreras you will see almost all of the archipelago’s iconic wildlife: white tipped sharks, sea lions, turtles, rays, penguins, and of course pelicans and blue footed boobies. You will have a chance to snorkel in the bay – and don’t be surprised if some of the penguins or sea lions jump in to play alongside you in the water. In the afternoon you walk from your hotel to the local giant tortoise-breeding center and on the way may catch a glimpse of pink flamingos feeding in a lake. Once at the Center your guides will explain the process of breeding and then releasing into the wild these giant slow moving creatures whose Spanish name (meaning saddle) gave the Islands their present title. The breeding center is an important conservation tool and it is here that the islands’ giant tortoise population is recovering. Today, you’ll be picked up at 7:30 a.m. Volcanic eruptions created all the islands in the Galapagos, and you will get to see this geologic process first-hand as you explore Isabela, one of the youngest and most volcanically-active islands of the archipelago. You ave the whole day to explore the Isabela highlands, and you start by hiking up to the crater of the Sierra Negra volcano, and then to the rim of the Volcan Chico. This fascinating walk usually begins with some morning fog and drizzle which sometimes persists in the shadow of the volcano, adding to its mysterious character. But when you reach the rim of the Sierra Negra crater, the second largest in the world after the Ngorongoro in Tanzania, you will see why it has been worthwhile. The crater is so large, and the views so expansive, that photos don’t even do it justice. Later, as you head towards Volcan Chico, you may get the feeling you are walking on Mars, but while the landscape appears desolate, a closer look reveals small lizards scurrying about the rocks. After Volcan Chico under the shade of a lovely “jaboncillo” tree you will enjoy a picnic lunch with the chance to enjoy some spectacular views over the central and northern parts of Isabela Island. In the distance, you will be able to see Fernandina, Pinzon and Santa Cruz Islands. You will then head back down to complete your day of hiking (16 km in total) and relax on the beaches of Puerto Villamil. This morning you leave from the Villamil dock at 8 a.m. and paddle to Island Bay. En route you will be looking for turtles, rays, penguins, and blue-footed boobies; sea lions will probably paddle along with us as well. 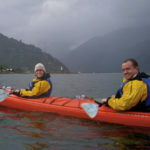 After watching the wildlife in the Bay, you will paddle back to the Villamil dock. In the afternoon, you will bike the Wetlands Trail where you can see marine iguana colonies and a number of different types of mangroves trees (all four can be seen here) as well as enjoying the network of trails, beaches and historic sites. At the end of the trail is the Wall of Tears, built in the late 1940’s by Second World War prisoners held at the US base on the islands. Your guide will explain the importance of the Wall of Tears, giving us a glimpse into the lives of the island’s previous inhabitants. On this network of trails, you will catch some beautiful views of the village below and you will have the chance to see birds and, with luck, some wild giant tortoises. You stop at the local swimming hole where you can take a refreshing dip. When you get back to town, there will be time to relax and enjoy some swimming or snorkeling in your Galapagos paradise or if you prefer to just sit on the beach and relax. Today you will start early, catching your speedboat at 5:20 a.m. in the morning and heading to Santa Cruz Island. When you arrive at Santa Cruz, you will enjoy a hearty breakfast close to the docks before heading up to the highlands for a busy day of multi-sport activities. You will drive to an off-the- beaten-path area of Santa Cruz Island, and when you reach a high point on the road you switch to mountain bikes for a long downhill glide on freshly paved roads to Garrapatero Beach. On the ride, you will pass small farms and enjoy views of the ocean and the distant islands. Once back in the town, you will have the option of staying and shopping for souvenirs, or (if time allows) walking the 3 km boardwalk to Tortuga Bay, and checking out one of the largest and most beautiful beaches in the Galapagos. At Tortuga Bay you can walk on the beach, swim, or even snorkel a bit more. Tonight you stay in Santa Cruz’ largest town, the small picturesque port of Puerto Ayora. Although it has the largest population in the Galapagos, Puerto Ayora is still a small, intimate place where you will find friendly local bars, shops, and restaurants, as well as places to stroll along the water’s edge. There is everything you need for a mellow night in the Galapagos. Today you will be picked up at 8:30 a.m. After a morning visit to the Charles Darwin Research Center, you will be transferred to Baltra for your return flight back to mainland Ecuador. Upon arriving in Quito you will be responsible for checking in for your evening overnight flight home.